In spite of protective ventilatory strategies, Acute Lung Injury (ALI) remains associated with high morbidity and mortality. One reason for the lack of therapeutic options might be that ALI is a co-morbid event associated with a diverse family of diseases and, thus, may be the result of distinct pathological processes. Among them, activated neutrophil- (PMN-) induced tissue injury and epithelial cell apoptosis mediated lung damage represent two potentially important candidate pathomechanisms that have been put forward. Several approaches have been undertaken to test these hypotheses, with substantial success in the treatment of experimental forms of ALI. With this in mind, we will summarize these two current hypotheses of ALI briefly, emphasizing the role of apoptosis in regulating PMN and/or lung epithelial cell responses. 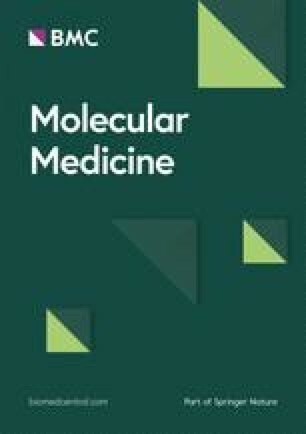 In addition, the contribution that Fas-mediated inflammation may play as a potential biological link between lung cell apoptosis and PMN recruitment will be considered, as well as the in vivo application of small interfering RNA (siRNA) as a novel approach to the inhibition of ALI and its therapeutic implications. ALI and Acute Respiratory Distress Syndrome [ARDS] represent a form of lung dysfunction characterized by hypoxemia and diffuse bilateral infiltrates of the lung often accompanied by pulmonary edema, reduction of lung compliance, and a decrease in the functional residual capacity of the lungs (1,2). In 1967, Ashbaugh et al. described 12 patients with acute respiratory distress, oxygen refracted cyanosis, and diffuse lung infiltrates, and, thus, provided an early description of ALI (3). ALI and ARDS can be of pulmonary (direct) or extra-pulmonary (indirect) origin. Direct ALI (for example, from pneumonia or aspiration) attributes to about 55% of ALI, meanwhile, indirect ALI can be seen in 20% (for example, due to extra-pulmonary sepsis or trauma) (4). In about 21% of instances, there are mixed factors contributing to ALI; in about 4%, no underlying pathophysiology can be distinguished (4). The incidence of ALI and ARDS in the United States of America has been reported to be 79:100,000 and 59:100,000 persons per year, respectively (2,5,6). In the next 25 years, it is anticipated that the incidence will double, based on the exponential growth of the population (5). The highest incidence of ALI is seen during sepsis, accounting for 46% of direct and 33% of indirect ALI (5); in total, around 25% of all ARDS cases stem from a severe sepsis (4). Around 7% of intensive care patients eventually will develop ALI/ARDS (4,7). Recent studies suggest a lethality of around 40% for ALI or ARDS (2,5), partly influenced by premorbid conditions (8) and the underlying pathophysiology (9). Thus, the presence of sepsis represents one of the highest risks factors for mortality from ARDS (up to 50%) (4,10,11). Even when patients are fortunate enough to survive ARDS, they suffer from long term disabilities, such as reduced vital capacity and physical strength and also from cognitive deficits (12, 13, 14). While advances have been made, the therapeutic interventions to treat ALI or ARDS still remain limited. They include lung protective ventilatory regimens with low tidal volume ventilation (15) and intermittent prone positioning, at least in a selected patient population (2). Several treatment options such as corticosteroids, immuno-nutrition, surfactant, etc. (reviewed in 2) still have to be proven to have beneficial effects on outcome parameters. However, thus far, no pathophysiologic driven therapeutic intervention has yet become available. The aim of this review is, therefore, to elucidate mechanisms of ALI pathogenesis, focusing on two main theories. The first, that neutrophils (PMN) can play a central role in driving ALI and the second, that lung epithelial cell apoptosis represents an important pathological aspect inducing lung injury. In this regard, we discuss the data in the field as well as some of our own findings using a clinically relevant double-hit mouse model of indirect ALI induced by hemorrhagic shock and subsequent polymicrobial sepsis. In addition, a novel strategy, i.e. the use of siRNA in mouse lungs in vivo, has served us in broadening our understanding of the pathology of ALI. The pathophysiologic mechanisms of ALI are insufficiently understood. In the common finale of this heterogeneous entity, the alveolo-capillary barrier is compromised allowing consecutive edema formation in the interstitium as well as alveoli, thus compromising gas exchange leading to organ dysfunction and respiratory failure. Histological evaluation of lungs from ALI patients indicated substantial accumulation of activated PMNs, diffuse alveolar damage, loss of epithelial integrity, and increased pulmonary edema (16,17). There are several proposed mechanisms which are believed to account for this phenomenon. Among leukocytes, PMNs are considered the first line of defense against microorganisms. Rapidly recruited to the inflammatory site/organ, they exert a variety of primarily beneficial functions (phagocytosis, production of reactive oxygen species [ROS], and nitric oxide species [NOS], degranulation of lytic enzymes, etc. ), that, when well orchestrated, enable clearance of the invading pathogen. However, it is also hypothesized that activated PMN may possess harmful potential when these same functions are directed at otherwise normal host tissue, culminating in injury and organ damage (Figure 1). There is substantial evidence that the lung is particularly susceptible for PMN accumulation. In contrast to most other organs, where PMN sequestration occurs at post-capillary venules, pulmonary PMN retention takes place within the pulmonary capillaries, representing a complex interconnecting network of short capillary segments where the course from arteriole to venule crosses numerous alveolar walls and often includes more than 50 capillary segments. The blood in this complex network contains 50 times more PMN compared with most other vascular beds (reviewed in 18). Proposed mechanisms of acute lung injury through hemorrhagic shock (HEM) “priming” for inflammation (Infl./red color)/apoptosis (Ao/ gray color)/injury, and “triggered” by a subsequent infectious insult: The resting lung (A) is primed by divergent inflammatory mediators released during an initial event (for example, shock, inflammation, etc.) that acts on a number of cells in the blood (MΦ: monocytes, PMN: neutrophils) and lung (EP: epithelial cells, EC: endothelial cells, AMΦ: alveolar macrophages) (B). These cells, in turn, stimulate, either separately or concomitantly, the pro-inflammatory response and/or the Ao of a small number of EP, both through Fas-FasL activation. The release of chemokines like MCP-1 then primes the AMΦ. When, at a later time, a subsequent inflammatory/infectious (‘trigger’) event takes place (C) the local EC, AMΦ, and/or EP become activated, release chemokines and activating agents that recruit the primed and now activated leukocytes (PMN, MΦ) to the lung (D). These activated leukocytes then transmigrate into the interstitium and alveoli where they perform their effector roles (in the absence of infection, the effector response may be solely injurious). In addition, they may propel the inflammatory/apoptotic response into a vicious cycle by further activating Fas through FasL on their cell surface (E). PMN accumulation has been observed early in lung tissue (19,20) as well as in bronchoalveolar lavage fluids (BALF) of ARDS patients (16). When developed during neutropenia, ALI rapidly progressed once PMN counts were restored (21,22). Furthermore, the degree of neutrophilia in BALF has been correlated with poor prognosis in septic ARDS (23). In an experimental setting of indirect ALI stemming from hemorrhagic shock (HEM) followed by polymicrobial sepsis, we found that, in response to HEM, circulating PMNs exhibited an ex vivo increase in respiratory burst capacity and a decrease in apoptosis. This is consistent with the concept that shock/injury can produce in vivo “priming,” the significance of which could be seen when HEM then was followed by sepsis, as recruitment of these PMNs into the lung occurred, along with the development of ALI (24). Also, when these HEM-primed PMNs were injected intravenously into PMN-depleted animals, which subsequently underwent cecal ligation and puncture (CLP) to induce sepsis, ALI again resulted (24). Upon this background, using different models of ALI, we (25) and others (26, 27, 28, 29, 30, 31, 32) have found that depletion of PMNs actually may serve to decrease injury associated with ALI. Thus, depletion of PMNs prior to HEM and sepsis markedly reduced the extent of lung inflammation and ameliorated lung protein influx and the severity of ALI (25), which is in line with findings during transfusion-induced ALI (29). Inflammation—Priming PMNs. Inflammation is closely linked to the pathogenesis of ALI. Levels of Interleukin (IL)-8 and IL-1 have been found increased in the lungs of ALI patients (33,34) and the persistent increase of inflammatory cytokines in the lung correlated with poor outcome in ALI (35, 36, 37). Inflammatory mediators exert several effects on PMNs. For example, complement protein C5a activates PMNs, thus contributing to their pulmonary sequestration and mediating lung tissue injury (38,39). Several inflammatory mediators, including complement, cytokines, chemokines, and lipid mediators also are able to induce the expression of surface molecules on the endothelium, which further promote PMN recruitment (40,41). Tumor necrosis factor (TNF)-α and IL-1β are two important cytokines that are found regularly in the BALF of ARDS patients (36,42,43) at higher concentrations than in their plasma, thus supporting their local origin (35,44). However, anti-TNF and anti-IL-1 therapies have failed to protect septic patients from ALI (44,45). Pro-inflammatory cytokines also are regularly expressed by activated PMNs traveling to the lung (32). They appear to be a relevant source of IL-1β, favoring the subsequent release of other mediators, such as TNF-α, MIP-2, and IL-8 (46, 47, 48). However, an early anti-inflammatory response driven by IL-1-, TNF- and IL-6-receptors, with early peaking IL-10 levels, was also shown in ARDS patients (41). In addition, PMN stimulation with lipopolysaccharide (LPS) or TNF-α showed an activation of nuclear factor kappa B (NF-κB), p38, and AKT (49,50). The degree of nuclear translocation of NF-κB in peripheral PMNs from patients with septic ALI was linked to ventilator time and survival (50). PMNs on Their Way to Lung— Sequestration, Adhesion, Migration, Activation, and Tissue Injury. First, in response to inflammatory mediators, PMNs migrate to the pulmonary capillaries in preparation for extravasation (Figure 1). Initial changes in the cytoskeleton prevent PMNs from deforming, making it less likely for them to pass through the pulmonary capillaries (51). In this regard, activated PMNs from ARDS patients appeared even more rigid than those from septic patients (52). Second, emigration of PMNs and passage through the endothelium can be regulated through adhesion molecules (51). While their initial sequestration appears to be independent from adhesion molecules, the durability of this process could rely on them. Thus, while L-selectin-deficient mice showed a normal pool of marginated PMNs and cleavage of L-selectin from the PMN surface did not alter this margination (53,54), L-selectin deficient mice exhibited only a very short and transient leukopenia in response to complement activation (53,55). PMNs can adhere to endothelial cells using CD11/CD18 interacting with intercellular adhesion molecule-1 (ICAM-1) on the endothelial side. Thus, PMN emigration in response to Escherichia coli (E.coli), E.coli lipopolysaccharide, Pseudomonas aeruginosa, immunoglobulin (Ig) G immune complexes, and IL-1 was mediated through CD11/CD18, but this did not appear to be the case in response to Streptococcus pneumoniae, Group B Streptococcus, Staphylococcus aureus, hyperoxia, or C5a (56). Even in CD11/CD18-dependent migration, blocking of CD18 reduced PMN emigration only by 60% to 80%, suggesting that other redundant mechanisms mediated these effects (56). Cytokines and chemokines such as IL-8 also have been shown to be involved in increasing β2-integrin avidity (57). It is important to understand that activation of PMNs is associated closely with the endothelial interaction mediated by the adhesion molecules (57,58). Rolling PMNs might well integrate the sum total of inputs received while scanning the endothelium. If an activation threshold is reached, β2-integrins switch to the high-affinity conformation, redistribute on the cell surface, and trigger arrest and adhesion (59,60). However, integrins also are involved in PMN migration, phagocytosis, respiratory burst, and even cytokine production (57,61,62). As eluded to above, chemokines are critically involved in the activation and recruitment of PMNs to the lung, potentially contributing to their harmful effects on an organ level. In this regard, associations between chemokines, lung neutrophil influx, and alveolo-capillary dysfunction have been reported (63,64). In our experiments, we observed that during hemorrhage-induced septic ALI (24), as well as after experimental blunt chest trauma (65), chemokines are markedly upregulated locally in the lung of the animals, as well as systemically. Blockade of the CXCR (chemokine [CXC motif] receptor) 2 using antileukinate, a hexapeptide inhibitor, following HEM, reduced lung PMN influx in response to subsequent sepsis and additionally decreased lung inflammation and lung protein leak, while pulmonary IL-10 levels were markedly increased (66). We also administered anti-KC or anti-MIP-2 antibody into mice immediately following HEM. The adoptive transfer of PMN isolated from the anti-MIP, but not from the anti-KC-treated donors, exhibited a reduction of lung inflammation and lung PMN influx in the recipients in response to sepsis when compared with control Ig-treated donors (67). These data demonstrated that hemorrhage-induced priming of PMNs not only mediated experimental ALI, but also that this process was differentially effected by MIP-2 and KC, although both signal through CXCR2 in mice. However, as humans utilize IL-8 in place of the two mouse a-chemokines and because receptors for IL-8, i.e. CXCR1 and CXCR2, also are utilized differently, these murine chemokine data may not translate directly to the patient setting of ALI/ARDS (68). Once activated PMNs have reached the lungs, they possess the potential to induce tissue injury. The release of ROS/NOS has long been thought to be a central effector mechanism of PMN-mediated lung injury (69). In this regard, while the inhibition of the nicotinamide adenine dinucleotide phosphate (NADPH) oxidase attenuated sepsis-associated ALI (70), surprisingly, NADPH oxidase-deficient animals were not protected from complement-induced ALI (71). On the other hand, inhibition/ deficiency of the nitric oxide synthetase showed protection in complement-/ endotoxin-induced ALI (71,72). However, ROS and NOS also play additional roles as signaling molecules modulating kinases and phosphatases, receptors and transcription factors (reviewed in 73) complicating the interpretation as to whether their net pulmonary effect is one of harm or help. Proteolytic enzymes also are a part of the PMN pathogen-clearing arsenal. While neutrophil elastase, cathepsin G, and metalloproteinases all have important roles in clearing invading pathogens and function in aspects of tissue remodeling/wound healing, they also are able to mediate neutrophil-induced tissue damage and can degrade extracellular matrix efficiently. Thus, while inhibition of neutrophil elastase improved respiratory function during septic ALI (74), its deficiency also rendered mice more susceptible to gram negative, but not gram positive sepsis (75). In addition, deficiency of elastase and/or cathepsin G was accompanied by increased susceptibility to fungal infections, but decreased susceptibility to endotoxin-mediated inflammatory ALI (76). Activated gelatinase A correlated with protein accumulation in the epithelial lining fluid in ARDS patients and might, therefore, be a potential marker for ARDS (77). The inhibition of matrix metalloproteinases and elastase prevented lung dysfunction and reduced septic ALI in pigs (78). The detailed mechanisms by which PMN mediate ALI via the involvement of proteolytic enzymes are reviewed in detail elsewhere (79,80). Regulation of PMN Apoptosis. Neutrophils, once mature, exhibit a constitutive form of programmed cell death with a life span between 6 to 12 h in circulation. Under normal circumstances, activated PMNs are eliminated fairly quickly once the invading pathogen has been cleared. Several inflammatory agents, such as LPS, TNF, IL-8, IL-6, IL-1, Granulocyte [macrophage] colony-stimulating factor (G [M] -CSF), etc., can inhibit PMN apoptosis (81, 82, 83, 84). The delayed apoptotic response provides PMNs with a longer life span, which, in turn, allows them to accumulate at local tissue sites of inflammation/infection. In this respect, PMNs obtained from patients following major trauma (85,86), burn injury (87), sepsis (88), and ARDS (89) all showed evidence of decreased apoptosis. The anti-apoptotic effect of ARDS plasma on PMNs appears to be mediated through the GM-CSF receptor (90). In sepsis, the delay in apoptosis was associated with a decrease in caspase-3 and -9 activity and a prolonged maintenance of the mitochondrial membrane potential (88). The delay of PMN apoptosis also involved the active regulation of CXC receptors by PMNs themselves (91). However, controversy persists as to whether this sustained activation actually contributes to organ injury. Activated PMNs have been shown to exert damaging effects in the lungs (68,92). However, following G-CSF treatment in pneumonia patients, no differences in outcome or time of recovery were noted, while it appeared that complications such as ARDS were decreased (93). These data were complemented by studies that indicated that GM-CSF in the air spaces was associated with improved survival in patients with ARDS (94). In our model of hemorrhage-induced septic ALI, it was evident that prolonging the lifespan of activated PMNs by using transgenic mice that overexpress the anti-apoptotic protein Bcl-2 in a myeloid-restricted fashion (95) did not exacerbate acute lung injury, although a prolonged presence of activated PMNs in the lung was evident (96). In contrast, we observed an initial survival benefit when the life span of PMNs was further prolonged, likely due to an enhanced capacity to clear bacteria as evidenced by the lower bacteria counts in the lung (96). In addition, in an inflammatory/ non-infectious environment, such as SIRS, mimicked by intraperitoneal injection of E. coli-LPS, prolonging the lifespan of activated PMNs was detrimental for the animals’ survival and was associated with an exacerbation of lung injury (96). Additionally, during non-infectious/ inflammatory ALI, failure to clear PMNs from the lungs contributed to increased inflammation and mortality (97). Together, these data imply that the tissue environment (infectious versus inflammatory) that the neutrophil encounters plays an important role in determining whether PMNs mediate organ damage or not. However, the mechanisms which determine whether PMN turn bad or good are not understood well and require further investigation. The above information makes a strong case for PMNs playing a significant role in ALI. However, it is interesting to note that ARDS has been described as developing in patients with neutropenia (98, 99, 100). In addition, following G-CSF therapy in pneumonia and sepsis patients, the incidence of ARDS was not increased (93,101) and, during experimental ALI or pneumonia, PMNs have been shown to migrate to the lungs without exerting deleterious effects (102,103). Thus, other mechanisms also are likely to be involved in the pathogenesis of ALI. In the development of ALI/ARDS, the loss of epithelial cells in the lungs with consecutive impairment of the integrity of the alveolo-capillary barrier is commonly noted (19,104). Type I epithelial cells make up approximately 90% of the pulmonary surface, and, while type II epithelial cells account for only 10%, they are critical because they produce surfactant and may differentiate into type I cells (17). Impairment of the alveolar epithelial barrier is, in many ways, important in the development of ALI. On the one hand, the epithelial barrier is, under physiologic conditions, less permeable when compared with the endothelial barrier, thus, destruction of its integrity prompts a progressive influx of protein-rich fluid into the alveoli (17,102). On the other hand, the loss of epithelial integrity represents an impairment of the physiologic trans-epithelial fluid transport and further inhibits the re-absorption of the alveolar edema (105,106). Thus, while an isolated injury to the endothelium still leaves intact the capacity of the epithelium to counteract pulmonary edema formation, the fluid balance becomes rapidly disturbed upon injury of the lung epithelium (107,108). Therefore, it is not surprising that the extent of epithelial damage and impaired edema re-absorption was linked clinically to outcome in ALI (109). Additionally, the accompanying reduction of surfactant production led, via an increase in the surface tension, to an augmented respiratory effort affecting gas exchange (110,111). Programmed cell death/apoptosis of lung epithelial cells represents a potentially important mechanism contributing to the loss of this cell type in the development of ALI (Figure 1). Bachhofen et al. reported that patients who died from ARDS exhibited excessive apoptotic alterations in the chromatin of their alveolar type II cells (19). Subsequent studies then confirmed these DNA fragmentations (112) as well as an increased expression of the pro-apoptotic protein Bax (Bcl-2 associated X protein) (113). More recent studies also have suggested a role for lung epithelial cell apoptosis in pediatric ARDS (114). Importantly, epithelial cell and PMN apoptosis is differentially regulated during ARDS. While, as mentioned earlier, PMNs show a decreased rate of apoptosis, it is increased markedly in epithelial cells (107). Local mediators in the lungs of these patients may regulate these opposing effects (115,116). Interestingly, the induction of lung epithelial cell apoptosis appears to lead to the development of ALI, which is further aggravated, when apoptosis is additionally induced in macrophages (117). Furthermore, inhibition of apoptosis, using a caspase inhibitor, protected mice from the lethal consequences of endotoxin-associated ALI (118). In addition, Bcl-x(L) treatment reduced albumin leakage and lung tissue damage in LPS-mediated ALI (119). In the induction of lung apoptosis during ALI, Fas- (an apoptotic death receptor pathway) mediated cell death also appears to play a major role (Figure 2). In this regard, during endotoxin-induced ALI, an increase of Fas expression on epithelial cells, as well as an immigration of Fas-ligand (FasL) expressing cells in(to) the lung, was observed (120). Human lung epithelial cells also expressed Fas and were, particularly in the distal airways, sensitive to Fas-mediated apoptosis (121). Caspase-cleaved cytokeratin-18, a marker for epithelial cell apoptosis, also was increased in BALF during ARDS (122). During ALI and ARDS, an increased concentration of Fas and FasL in patients’ BALF and lung tissue was detected (122,123) and BALF from ARDS patients was shown to induce apoptosis in healthy lung epithelial cells (116). Furthermore, ARDS non-survivors exhibited markedly higher FasL concentrations when compared with survivors (116). Particularly during septic ALI, an infection-severity dependent activation of the Fas-FasL system in the lung was observed (124). FasL concentrations have been reported to be much higher locally than systemically, suggesting its origin is pulmonary (122,123). In this respect, there appear to be several potential sources of FasL: infiltrating monocytes have been implicated (but not alveolar macrophages) (125), PMNs have been implicated (126), and FasL may be cleaved from cell membranes by the activation of matrix metalloproteinases 3 and 7 (127,128). However, anti-apoptotic proteins such as soluble Fas (129) also appear to be increased during ARDS (122,123) and have been described to correlate with clinical features such as the PaO2/FiO2 ratio (122). This may point toward a simultaneous activation of protective anti-apoptotic mechanisms during ALI. Proposed FasL-Fas signaling in lung epithelial cells and its potential effects. Also, illustrated points at which the pathway(s) has (have) been inhibited. FADD (Fas associated death domain), FLIP (FLICE [FADD like interleukin-1] inhibitory protein), TRAF (Tumor Necrosis Factor Receptor-associated Factor), Raf, ERK (extracellular signal regulated kinase), NF-κB (nuclear factor kappa B), siRNA (small interfering RNA). Under experimental conditions, the instillation of Fas-activating antibody into murine lungs induced apoptosis of lung epithelial cells, PMN recruitment and impairment of the alveolo-capillary barrier (130). This development of Fas-dependent lung injury was linked to Fas-expression on non-myeloid but not myeloid cells (131). Furthermore, blocking of the Fas-FasL system reduced the development of endotoxin-mediated ALI (120). Our experiments further demonstrated the relevance of Fas-mediated apoptosis in the lung during HEM-induced septic ALI (132). Fas and FasL mutant animals exhibited less pulmonary epithelial cell apoptosis in response to the insult when compared with background animals. In addition, the extent of ALI as assessed histologically and by protein influx was diminished significantly. This was associated with a survival benefit for Fas mutant mice when compared with background animals (132). It also has been reported that Fas-FasL deficiency is associated with a reduction in the degree of injury seen during direct ALI in E. coli, S. aureus, or S. pneumoniae sepsis models (133). Similar results were described for sepsis induced by Legionella pneumonia (134). In contrast, data from pulmonary sepsis following lung infection with P. aeruginosa suggest a reduction in lung apoptosis in the absence of Fas signaling as well, but a decreased survival rate was observed, associated with an increased dissemination of the bacteria (135). It should be noted that Fas-mediated apoptosis in the lung appears to be modulated by several factors such as surfactant protein A, Angiotensin II, transforming growth factor (TGF)-beta, decoy receptor 3, etc. (reviewed in 108), and that other apoptotic pathways, for example, mediated by TNF-α (136) or mitochondria (137), appear to play a role under certain circumstances, too. 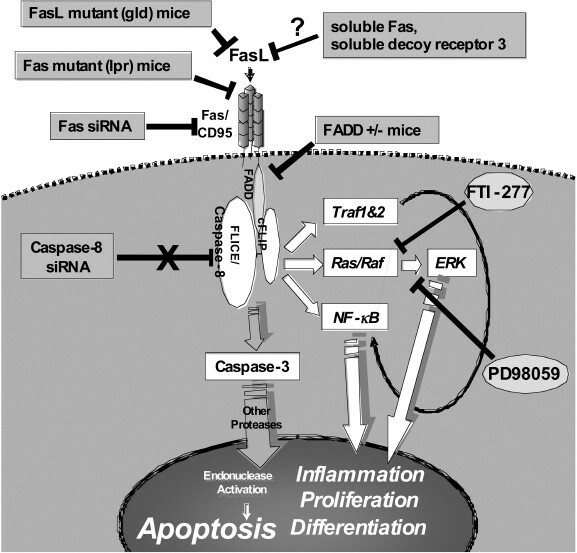 Fas-Induced Inflammation—Linking PMN Recruitment and Lung Apoptosis? Recent studies suggest that activation of Fas serves not only to induce apoptosis, but also to induce the secretion of cytokines and chemokines by a variety of cell types (138) (Figure 2). In murine lungs, activation of Fas initiated a profound inflammatory response with an early generation of chemokines and subsequent recruitment of neutrophils (130,132,139). This response could be reduced by antagonizing Fas ligand (139). Triggering of Fas also led to increased concentrations of TNF-α, MIP-1 α, MIP-2, monocyte chemotactic protein (MCP)-1, and IL-6, and compromised the alveolo-capillary barrier (133). LPS-mediated pulmonary inflammation also appears to be regulated through Fas (140). Mice, genetically altered to express Fas either on myeloid or on non-myeloid cells in the lung, presented no marked increase of inflammatory mediators following Fas activation (131), in contrast to non altered mice lungs (130, 132,139). With respect to cell types involved, it has been indicated that activation of Fas on monocyte cell lines induced production of MIP-2 (141). The activation of an inflammatory program by Fas also was shown for peritoneal macrophages (142), monocytes and macrophages (143), endothelial cells (144), and others (145, 146, 147, 148, 149, 150, 151). Our own experiments with the Fas and FasL mutant mice showed a marked decrease in inflammation in the lungs of these animals in response to hemorrhage-induced septic ALI, when compared to background animals (132). This phenomenon also was evident following Fas silencing in the mouse lungs using siRNA (152) and was associated, in both cases, with a reduction of PMN immigration into the lungs (132,152). Further experiments revealed that lung epithelial cells were capable of secreting MIP-2, KC, and MCP-1 in vitro in response to Fas activation, through mechanisms involving ERK and, potentially, FLIP (132), complementing the findings of other researchers who demonstrated that a NF-κB dependent mechanism appears to underlie this response (151). Instillation of a Fas-activating antibody into transgenic murine lungs in which lung macrophage numbers are markedly reduced displayed a similar inflammatory response as seen in background animals, further supporting a role for Fas-mediated, epithelial cell-induced pulmonary inflammation in vivo (132). The fact, that inhibition of Fas activation modulated both PMN recruitment into the lung as well as pulmonary epithelial apoptosis, intriguingly points at its value as a potential therapeutic target in ALI. The use of silencing RNA (siRNA) represents not only a potentially powerful experimental approach to allow us to better understand the evolving pathology of ALI, but may possibly represent a novel therapeutic approach to the treatment of this condition. The history of siRNA, its discovery, development, the mechanisms involved, as well as its successful initial uses in mammals in vivo are described elsewhere (153, 154, 155, 156). With respect to its application in vivo, the lung appears to be a good candidate, as it can be accessed straightforwardly intranasally (i.n.) or intratracheally (i.t.). Nevertheless, nucleic acid transfer efficiency can be diminished substantially by phospholipids and proteins, which are major components of the airway surface liquid (157). Interestingly, unlike systemically, delivery of naked siRNA into the lungs has proven very efficient (152,158,159), thus potentially complex and costly approaches using vector systems or chemical siRNA modifications may not be necessary. In this regard, the delivery of siRNA inhibitors of SARS coronavirus in 5% glucose was superior, even in reducing the severity of the disease, than when given in modified calf pulmonary surface active material (160). As early as 2004, the feasibility of a surfactant-based or naked siRNA approach in the mouse lung targeting glyceraldehyde-3-phosphate dehydrogenase (GAPDH) or heme oxygenase-1 during ischemia-reperfusion, respectively, has been demonstrated (161,162). Phase I/II trials for Respiratory Syncytial Virus have been conducted and are now on their way to evaluate the safety, tolerability, and antiviral activity of siRNA treatment in human lungs (155,158,163). Using siRNA to Treat Murine ALI. With respect to the application of siRNA in the in vivo setting of the lung, initially we attempted to extend our observation that blockade of MIP-2 or KC with conventional antibodies effected the development of ALI (67) by using an in vivo approach silencing these same chemokines locally in the lung (164). Subsequently, we initiated studies with anti-apoptotic siRNA against Fas and caspase-8 assessing their capacity to protect the lung from the detrimental effects of hemorrhage-induced septic ALI (152). However, to establish the initial feasibility of in vivo siRNA administration, mice overexpressing green fluorescent protein (GFP) were chosen to receive a single intratracheal instillation of a GFP-silencing RNA. What we found was that green fluorescence in the lungs of these animals at 18 h post-instillation was reduced by at least 65% when compared with vehicle-treated GFP mice, while no decrease in fluorescence was seen in other organs outside the lungs (152,164). The use of siRNA at these concentrations neither induced substantial activation of type I interferons (165,166) via activation of TLR-3 (167), TLR-7 (168), TLR-8, TLR-9, and protein kinase-R(PKR) pathways (169, 170, 171) nor via more classic proinflammatory processes (169,171). This is in line with reports demonstrating that intravenous delivery of naked siRNA did not induce an interferon response (170). However, the induction of STAT (signal transducers and activator of transcription)-1 in this context appears to be dose dependent (165), and thus it cannot be ruled out that different dosages, delivery, or timing of administration might have provided dissimilar results. To gain some insight into the cellular localization of siRNA in the lung, we followed the intrapulmonary deposition of Cy-5 fluorochrome labeled siRNA uptake by confocal immunofluoresence microscopy. Interestingly, labeled siRNA was found to co-localize only with lung epithelial cells counterstained with anti-cytokeratin-18 at 24 h post instillation, but not alveolar macrophages (152). However, negative results for alveolar macrophages may not preclude the uptake of siRNA by this cell type as one can imagine different kinetics in the various cell types with respect to siRNA uptake and processing. Relative to this, the feasibility of gene silencing in macrophages using siRNA has been described in vitro (172, 173, 174), however, silencing of typically macrophage-derived molecules such as TNF-α and IL-6 during indirect murine lung injury remained unsuccessful in our hands (unpublished observations). Whether this might be attributable to the underlying cell type or perhaps to the degree of up-regulation of a certain gene during pathological conditions remains to be elucidated. Irrespective these and the experiments below represent the first studies to demonstrate the feasibility of in vivo lung siRNA as treatment for developing ALI. To finally assess the therapeutic capacity of such a siRNA approach, experiments were designed to modulate PMN immigration based on the neutrophil hypothesis using in vivo siRNA constructs against the murine chemokines KC and MIP-2 during the development of indirect septic ALI. To this end, suitable siRNA constructs were instilled into the lungs of animals 2 h following HEM and prior to CLP. ALI was assessed 24 h after the induction of sepsis. Silencing of MIP-2 markedly reduced tissue and plasma IL-6 concentrations, tissue MIP-2, as well as lung PMN influx, interstitial edema, alveolar congestion, and disruption of lung tissue architecture (164). In contrast, KC-siRNA treatment, while reducing plasma KC, tissue KC, and tissue IL-6, produced neither a significant reduction in plasma IL-6 nor lung PMN influx nor lung damage (164). Alternatively, based on the epithelial cell hypothesis, siRNA sequences against Fas and caspase-8 were intratracheally instilled during septic ALI. Interestingly, while these sequences markedly diminished lung Fas and caspase-8 expression in a gene specific fashion, when lung apoptosis was assessed, pulmonary tissue caspase-3 activity was reduced only in response to Fas but not caspase-8 silencing. As silencing here, as commonly observed, did not result in a total depletion of the target protein, but rather in a diminished expression, it is possible that sufficient active caspase-8 was still present to mediate the apoptotic effects either through direct activation of caspase-3 or indirectly through cleavage of the proapoptotic protein Bid (152,175). Our data also indicated that silencing of Fas on lung epithelial cells was associated with a reduction in lung inflammation, PMN influx, and a diminished extent of lung injury (118), thus emphasizing the relevance of epithelial cell integrity during indirect septic ALI. Keeping in mind the diversity of clinical scenarios, we use the inclusive acronym ALI, one could think that it might be exactly this imprecise global view that prohibits the development of novel therapeutic approaches for ARDS. The diversity of underlying pathologic mechanisms prohibits the formulation of a unified pathophysiology of this clinical entity. Whether different forms of ALI (for example, direct versus indirect) are more of a response to a certain patho-mechanism than another remains to be determined. However, while there may be numerous diverse stimuli that can initiate the pathogenesis of this clinical entity, the final steps in ALI/ARDS, such as compromise of the alveolocapillary barrier function, appear to be somewhat common. Here we have reviewed the data which support the role of the activated PMN in lung injury as well as the contribution of epithelial cell death as independent entities contributing to ALI. Further, we have shown how recent studies looking at epithelial cells and the silencing of Fas-induced apoptosis and/or inflammation in these cells may serve as a lynchpin linking these two pathological processes. Upon early Fas activation, alveolar macrophages and lung epithelial cells might produce chemokines in the lung, thus attracting activated and potentially harmful neutrophils, monocytes, or even T-lymphocytes to the site of injury and potentiating the degree of injury. Finally, we trust we have illustrated how the application of siRNA-induced gene knockdown in the lung not only has produced novel insights into pathogenesis of ALI, but may represent a potential exciting therapeutic approach for its treatment. This work was supported in part by funds from the University of Ulm Medical School (M.P.) as well as NIH-RO1s GM53209 and HL73525 (A.A.).